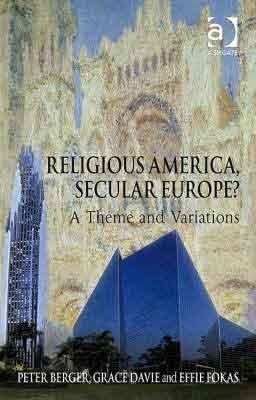 A review essay of Religious America, Secular Europe? A Theme and Variations by Peter Berger, Grace Davie and Effie Fokas, Ashgate, London, 2008. “In the name of freedom, individual autonomy, tolerance and cultural pluralism, religious people (Christian, Jewish and Muslim) are being asked to keep their religious beliefs, identities and norms ‘private’ so that they do not disturb the project of a modern, secular, enlightened Europe” (Josè Casanova, p. 62). The above statements by Peter Berger and Josè Casanova from the book Religious America, Secular Europe? hint at how topical, and relevant to present day cultural contrasts and tensions between Europe and America, is this particular book. This review essay complements the two articles on the same subject already contributed to Ovi: one revolving around the thought of Jurgen Habermas on a post-secular Europe and the other on the thought of professor JHH Weiler on the same subject. The book under review tackles head on a very important question: why does religion flourish in America, but languish in western and central Europe? Why are some issues about religion and public life in America nearly incomprehensible to Europeans (such as the use of religious language in political campaigns), and vice-versa (such as the French controversies over head-scarves)? The authors look at history, institutions, and the intellectual ethos of the two areas across the Atlantic pond. They also point out that "Europe" is not presently a religious unity as might have been in medieval times. Subsequent chapters explore the nature of Euro-secularity in more detail (the variations on the theme) - paying attention to its historical, philosophical and institutional dimensions. In each chapter, the similarities and differences with the American case will be carefully examined. These are the basic question analyzed by Peter Berger, the eminent Professor of Sociology at Boston, Grace Davie, of the University of Exeter and Dr Effie Fokas. The final chapter explores the ways in which these features translate into policy on both sides of the Atlantic. Moreover, the question of Euro-secularity as related to social difference (class, ethnicity etc. ), is also explored in depth. Important to notice that the main title of the book ends with a question mark. That means that whether or not we can categorically describe America as ‘religious’ and Europe as ‘secular’ remains problematic. To be sure, the theme of “euro-secularity” is throughout compared with the “religious” United States by looking at four dimensions or variations of the differences between the two. In that process one is struck by the exceptional and rather negative nature of Europe’s religious life vis a vis the more positive pro-religious trends elsewhere in the world. Why, for example, was it so contentious to suggest mentioning the Christian God in the preamble to the proposed European Constitution? Why do some Eurosceptics think that there is ‘altogether too much religion in the United States leading to a dangerous effect on policy’, and why are Americans in turn ‘taken aback by Europe’s secularity, what the French dub “laicitè”? Why in Europe religion is regarded as part of the problem, while in the United States it is considered part of the solution? The authors mince no words in stating that in Europe both Catholic and Protestant Churches are in deep trouble (p.11). The existence in European nations of a state Church is contrasted with a ‘seemingly limitless number of denominations in the United States. Noteworthy for the authors is that Europe has not been influenced by ‘the massive presence of Evangelical Protestantism which remains a crucial part of the American scene, and by American the authors mean South America too which has also experienced one of the most dynamic religious movement in the world today: Pentecostalism rivaled only by militant Islam. It is that contrast that revives fear of religious wars, clashes of civilizations and theocracy, religious fanaticism redolent of cultic extremism. The other side of that coin seems to be the main focus of this book and it is this: the challenge to the taken for granted theory on the part of Western intelligentsia that secularization is the inevitable result of modernization. The book concludes that that secularization is a particularly European experience. It also powerfully suggests, as strange and paradoxical as it may sound to European ears, that, despite differences between religious America and secular Europe, in the global future it will be entirely “normal” to be more fully modern and fully religious at the same time. In fact, a dialogue between world religions remains an urgent and necessary cultural task of our times. In his recent address at Cairo University President Obama suggested as much. There are important implications for foreign policies and western attitudes towards Islamic countries still embed, unfortunately, by the Voltairian anti-religion virus. It all comes together in Europe in the question of Turkey and this secular paradox as stated by the sociologist Josè Casanova: “In the name of freedom, individual autonomy, tolerance and cultural pluralism, religious people (Christian, Jewish and Muslim) are being asked to keep their religious beliefs, identities and norms ‘private’ so that they do not disturb the project of a modern, secular, enlightened Europe” (p.62). The future reality is that religious people cannot and will not do this as we learn to live in a post-secular society.It appears that such a scenario will result unacceptable in a post-secular Europe. What the concept of multiple modernities ultimately implies is that Western (especially European) modernity is not the only conceivable one. It can come with indigenous differences. It would be enough to consider India, the largest democracy on earth which enshrines religion as part of its heritage and cultural patrimony. If one takes a careful look at the world outside the West one immediately notices that it is religion which defines the aspiration to an alternate modernity. That may well surprise the “enlightened” European mind, but there is such a thing as a Russian modernity inspired by Russian Orthodoxy, an Islamic modernity, a Hindu modernity, and what may surprise them even more, an integrally Catholic modernity. That was pointed out by Professor JHH Weiler of NYU in a 2007 essay titled “A Christian Europe? Europe and Christianity: Rules of Commitment” by JHH Weiler in the journal European View, Vo. 6, n.1, December 2007, Springer, Berlin-Heidelberg. Those modernities are not illusions, as the old classical secularization theory tended to imply. Perhaps the greatest surprise of all might be that, as hinted above, that in many parts of the world the West is perceived in a pejorative way, as propagating a decadent. hedonistic culture of irreligious materialism. Such a perception is reinforced by both the influence of intellectuals, usually heavily secular, and the omnipresence of the Western mass media, much of whose content can indeed be defined as materialistic and irreligious. If that be true, it ought to be of great interest to the practice of diplomacy of Western democracies. At the very least, this crucial question ought to be asked and discussed: What are the consequences of taking seriously the empirical sociological fact that for the great majority of the world’s populations in the 21st century, it is not only possible, but quite normal to be both modern and religious? Might this question make a difference in the kind of paradigm that we construct in the West to understand a little better the nature of the modern world, be it European, American, Asian or African? Is it really “enlightened,” as the age of Enlightenment misguidedly supposed in Europe, to isolate the vast field of the sociology of religion, or should it be restored to its rightful place in the overall global social agenda? Which is to say, is the Enlightenment still to enlighten itself?